Cumberland, WI, is an area filled with friendly, caring people and a small-town feel that infuses all its residents with a sense of community. There’s also a thriving arts and culture scene, which includes a variety of events to enhance the camaraderie. 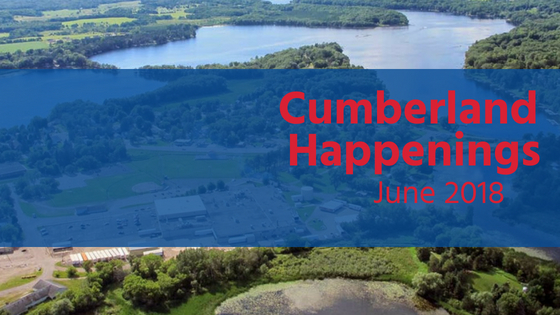 Check out our list of the top June happenings in Cumberland, courtesy of the team at RE/MAX Northstar. 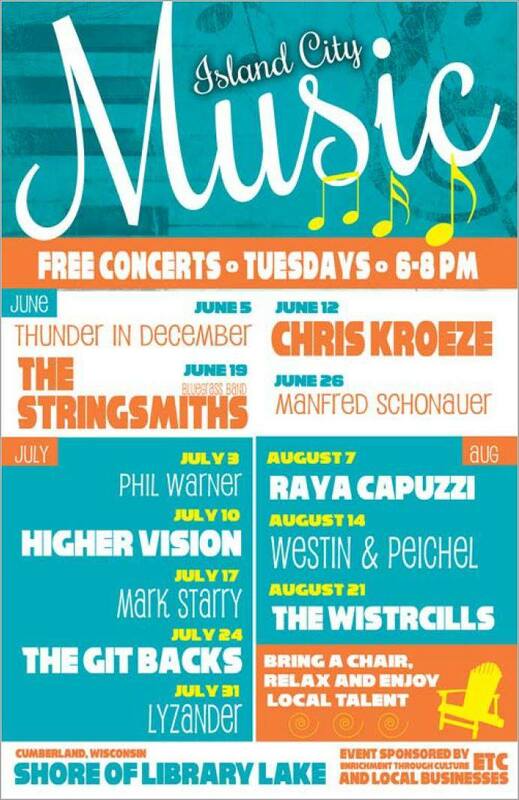 Sponsored by Cumberland ETC and several local businesses, these free concerts are Tuesdays from 6:00 – 8:00pm on the shore of Library Lake. You are invited to bring a lawn chair, sit back and relax while enjoying the local talent our small town has to offer. Starting in June, enjoy delicious drinks and gourmet cuisine at local restaurants featuring signature cocktails, seasonal specialty dishes and live music in a trendy, yet intimate, setting every Thursday night. Find out more about these upcoming events by visiting the Bistro 63 and The 5 O’clock Club websites. Sponsored by Enrichment Through Culture, the 27th annual Celebration of Arts and Crafts is a unique event that gives you an opportunity to experience beautiful, handcrafted gifts created by the finest artists and artisans in the area, as well as live music. Set in the picturesque Tourist Park, this event celebrates all the local culture and talent in Cumberland. The Methodist Church and Kinship also provides homemade treats and food, including Kettle Korn, caramel rolls and ice cream at the event. There’s also a large used book sale sponsored by the Friends of the Library. All proceeds from this sale benefit the Thomas St. Angelo Public Library. The 27th annual Celebration of Arts and Crafts takes place on Saturday, June 9 from 9 a.m. to 3 p.m. For more information, call Lisa Barrows at 715-822-2439 or email at Luv2bnNY@hotmail.com. 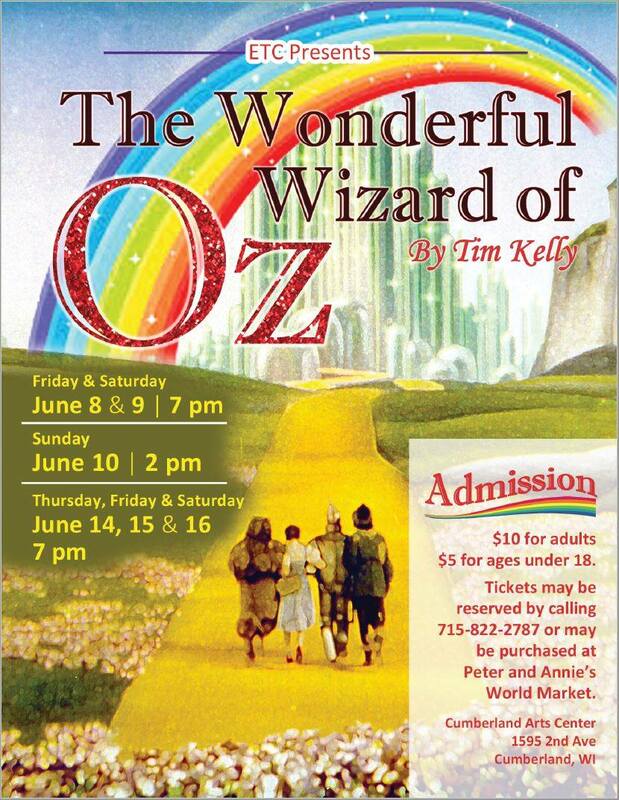 Experience Dorothy, Toto and all the other beloved characters in the whimsical land of Oz with the ETC Children’s Theater production of The Wonderful Wizard of Oz. This classic tale from L. Frank Baum is adapted for the stage for an experience that puts the audience front-and-center. There are showings Friday, June 8 and Saturday, June 9 at 7:00 p.m., Sunday, June 10 at 2:00 p.m. and Thursday, June 14, Friday, June 15 and Saturday, June 16 at 7:00 p.m.
Louie’s Finer Meats is hosting a free Fun Run/Walk that’s fun for the whole family. 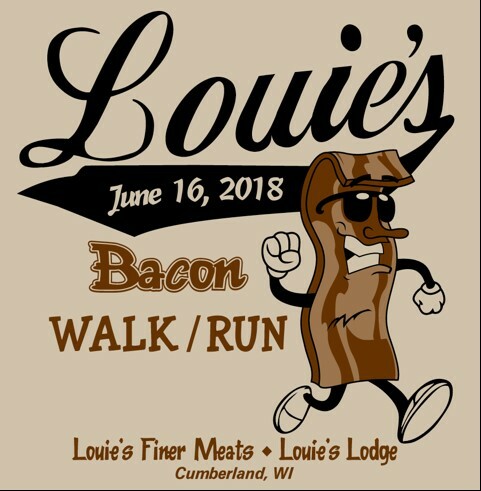 This unique event features bacon-inspired costumes, free bacon samples, event merchandise and in-store specials for Louie’s Finer Meats. Participants who complete the event win a Louie’s discount token, and the first-place male and female participants receive a special prize. The event takes place Saturday, June 16 at 9:00 a.m., and includes a one-mile walk and a two-mile run. For more information or to register for the event, visit https://louiesfinermeats.com/run/. 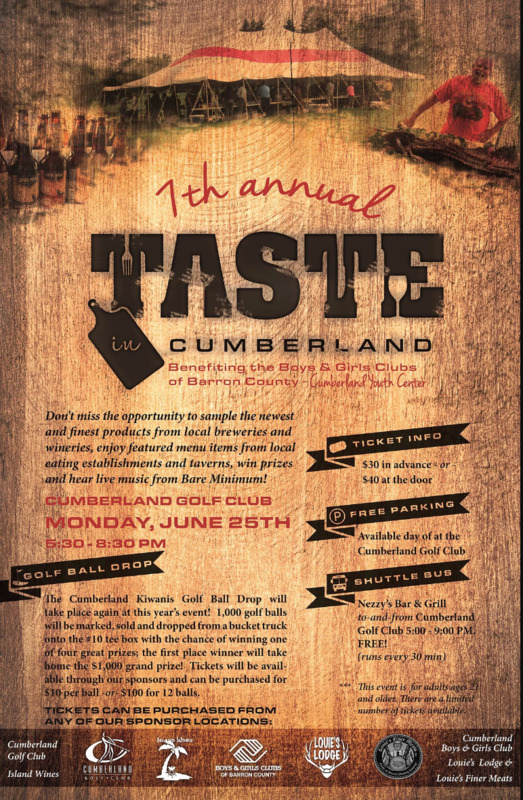 On Monday, June 25 from 5:30 p.m. to 8:30 p.m., sample the finest products from local wineries and breweries, as well as featured menu options from the top establishments in the Cumberland area, at Taste in Cumberland. This event also features live entertainment from the Bare Minimums and plenty of competitive events, including the Cumberland Kiwanis Golf Ball Drop with a variety of prizes. Tickets to the event are $30 in advance and $40 at the door, with all proceeds benefitting the Boys & Girls Clubs of Barron County. Tickets can be purchased at one of the sponsor locations: Louie’s Lodge, the Boys & Girls Club of Barron County, Cumberland Golf Club, Island Wines and Louie’s Finer Meats. For more information, call Deanna at 715-736-7445 or email at deanna@bgbarroncounty.org.